Fine. SET OF THREE PAPERBACK BOOKS, NO BOX...BOOKS LOOK MORE NEW THAN USED. SPINES NOT BROKEN...GIFT QUALITY~ 0716. Helquist, Brett. New. Trade paperback (US). Glued binding. 128 p. Contains: Illustrations. 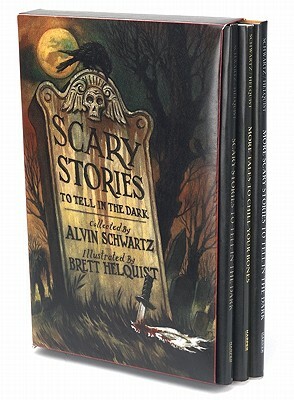 Scary Stories. Intended for a juvenile audience. Fair. 0061980935 DIFFERENTLY SIZED books with MISMATCHED COVER/BINDING ART. NO BOX. Light wear. Great deal on a reading set! 3 book set. Fair. 0061980935 MISMATCHED COVER/BINDING ART, same size books, NO BOX, some light wear. 3 book set. Good. 0061980935 Some light wear to books and box. 3 book set. Good. 0061980935 3 book set. NO BOX. Some wear. Fair. 0061980935 3 book set. NO BOX. Some wear to books. Mismatched set, uniform book size.